Robert Howard Myrick was born October 1, 1952 in Hattiesburg, Mississippi. Bob Myrick’s great uncle was two time A.L. All Star Buddy Meyer who played 17 MLB seasons. In 1928 Meyer won the stolen base crown (30) while with the Boston Red Sox. He then spent thirteen years with the Washington Senators, winning the 1935 A.L. batting title (batting .349). Meyer hit over .300 eight times in his career & was a lifetime .303 hitter (176th all time) with a .389 on base percentage (105th all time). At second base Meyer twice led the league in fielding. He also made two All Star teams & was considered in the MVP voting three times. The six foot left handed Myric went to Mississippi State getting drafted by the New York Mets in the 24th round of the 1974 draft. 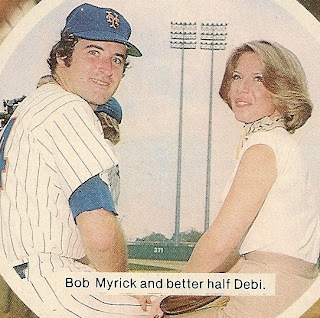 Bob Myrick never made an All Star team like his great uncle, he was pretty much a middle reliever for the Mets from 1976-1978. Myrick became a relief pitcher by the time he got to the AAA level. 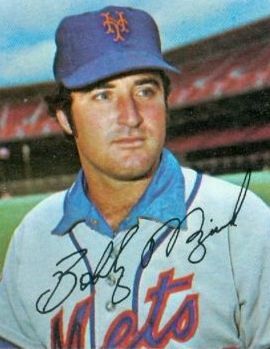 He made his big league debut at Shea Stadium, pitching to one batter on May 28th 1976 in a 6-0 Mets loss to the St. Louis Cardinals. He appeared in a dozen games in the bicentennial year, before getting his first win on July 27th. That day he pitched three scoreless innings against the Philadelphia Phillies. It took another nine outings until the end of September before he got another decision, this was his first loss. He made 29 appearances posting a 3.25 ERA in 27 innings with strike outs. 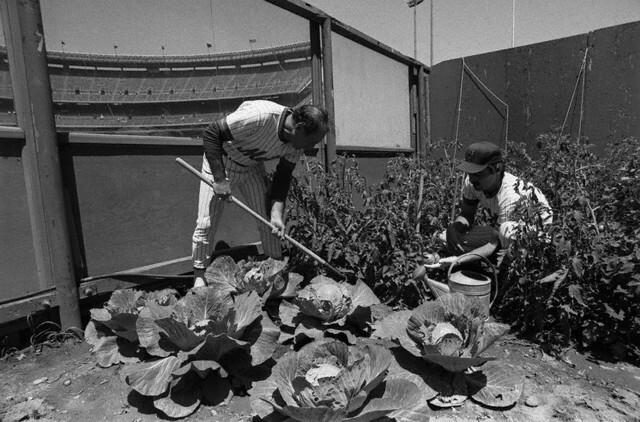 Myrick helped Joe Pignatano tender his tomato plants in the Met bullpen for the most part of his three years at Shea Stadium. 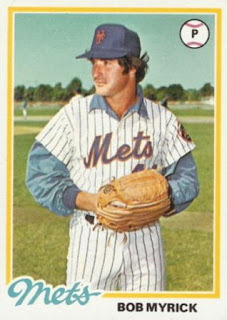 In 1977 his numbers were similar, going 2-2 with a 3.61 ERA, appearing in 44 games pitching a career high 87 innings. On August 5th he earned a win when Lenny Randle doubled home Doug Flynn in the 8th inning for the winning run. He earned his next win on September 11th pitching 3.2 innings at Wrigley Field in Chicago. During the final two weeks of the season he earned two saves, in games against the Chicago Cubs & St. Louis Cardinals. In 1978 he went 0-3 in the early part of the season, allowing nine earned runs & 13 walks in 24 innings pitched before getting sent back to AAA Tidewater at the end of May. Myrick never resurfaced to the majors, pitching in the minors through 1981. In 1979 he & Mike Bruhert were traded to the Texas Rangers for Doc Ellis. He pitched in the minor leagues through 1981 never making it back up. In three MLB seasons Myrick was 3-6 with two saves and a 3.48 ERA in 139 innings pitched over 82 games. Retirement: After baseball he returned to his Mississippi home town helping run a family building supply business with his brother & cousins. In August of 2012 he suffered a heart attack & passed away at age 59.